Architectural photography is the photographing of buildings and similar structures. It typically shows either the exterior or the interior of buildings. Throughout history, buildings have been highly valued photographic subjects, mirroring society’s appreciation for architecture and its cultural significance. Architectural photography has evolved and become more creative. Exterior architectural photography usually takes advantage of available light by day or at night, uses ambient light from, for example, adjacent street lights, landscape lights, exterior building lights and moonlight. In many cases, the landscaping surrounding a building is important to the overall composition of a photograph. Interior architectural photography can also be performed with ambient light from windows and skylights, as well as interior lighting. Frequently though, architectural photographers use supplementary lighting to improve the illumination within a building. Post processing is often used to achieve a balanced lighting scheme, even in the absence of additional lighting. Lewis Hine (1874-1940) was an American sociologist and photographer who used his camera as a tool for social reform. His photographs were instrumental in changing child labor laws in the United States. One of Hine’s most important and famous commissions was to photograph all stages of construction of the Empire State Building. He would hang from cherry-pickers, balancing 100 stories high to achieve certain aerial views, and swing out beyond the building to photograph and gather information on workers within the structure. These images are amazing but rather frightening. I won’t be doing this type of work! Ed Ruscha (1937-) is an American artist associated with the pop art movement. He’s worked in the media of painting, printmaking, drawing, photography, and film. The everyday or commonplace is the subject matter of much of Ruscha’s work. His black and white photographs and books depict banal and familiar subjects such as apartment blocks, car parks and palm trees. Speaking of his first book Twentysix Gasoline Stations 1962, Ruscha once said that his photographs were merely a collection of facts and his books are like ‘a collection of readymades.’ This type of work differs from street photography because it focusses on things rather than people, and the backdrop rather than the drama. Twentysix Gasoline Stations 1962 featured photographs Ruscha took as he travelled along Route 66, between Los Angeles and his parents’ home in Oklahoma City. The pictures, which have no people in them, don’t document a particular journey and there is no sense of narrative or story. Twenty Six Gasoline Stations was the first of 17 books that Ruscha made throughout the 1960s and 70s. His books are characterised by their use of serial photography, a sense of humour and small amounts of text. 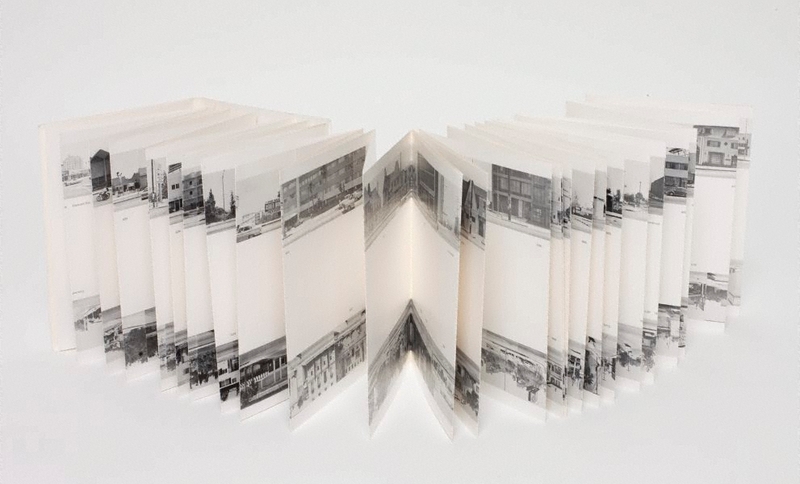 For his folding book Every Building on Sunset Strip 1966, Ruscha directly references the act of making a film. The photographs for this book were created by attaching a camera to a moving vehicle and shooting in real time. I love the long strip of images for Sunset Boulevard, leading the eye along the road, and through the book. I also like the images of gasoline stations because, although they are very ordinary, everyday places, they show a piece of history, of daily life in America. Bernd Becher (1931–2007) and Hilla Becher (1934–2015) were German conceptual artists and photographers working as a collaborative duo. They are best known for their extensive series of photographic images, or typologies, of industrial buildings and structures, often organised in grids. I like the structure of these series of images, and the way they are all taken from the same viewpoint. This makes them look similar but different, encouraging the viewer to compare and contrast. It would be good to try something similar. Tony Worobiec is a Brtish photographer. Together with his wife Eva, he has made frequent visits to the USA, documenting the depopulating areas of western Nebraska, North and South Dakota and south-eastern Montana. The culmination of this work has been the book Ghosts in the Wilderness; Abandoned America. 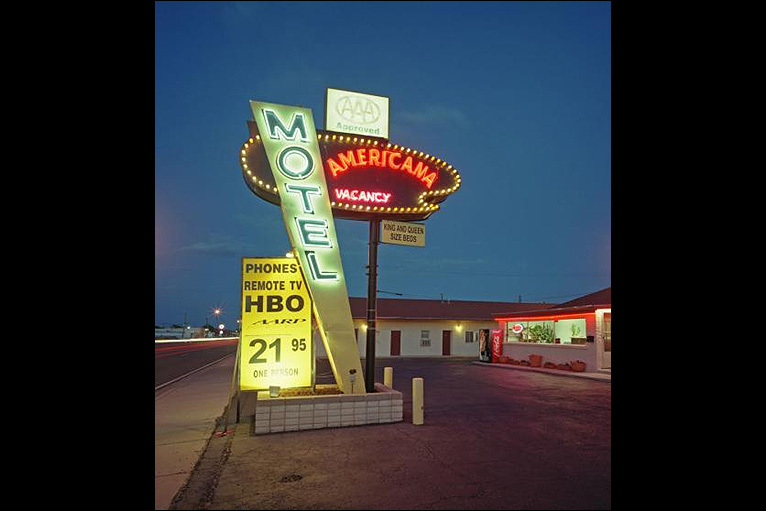 Worobiec also scoured the old American highways in search of the dwindling glamour of many of the independent diners, motels, hotels, and theatres that continue to survive. This work was an attempt to celebrate these iconic beacons, which epitomise the American dream, and to ensure that they do not become a fading memory. This project is called Icons of the Highway. I love abandoned buildings and the way nature takes them back. Worobiec’s images of the abandoned towns in America are beautiful but also rather sad and haunting. The icons of the highway at first glance seem more cheerful because they are brighter, including a lot of neon lights. However, they are also rather sad, showing the decline in the magic of 50s America. Joel Meyerowitz (1938-) is a street, portrait and landscape photographer. He began photographing in colour in 1962 and was an early advocate of the use of colour during a time when there was significant resistance to the idea of colour photography as serious art. In the late 70’s, Meyerowitz was commissioned by the St. Louis Art Museum to document the city. He produced a book of images that all feature the Gateway Arch, either large or small, seen from all over the city. I like the way that the arch is in every picture, sometimes dominating the image and sometimes difficult to pick out, sometimes complete and sometimes just a fraction of the whole. It’s be good to have a go at a project like this. Maybe Rhyl Sky Tower would be a good subject. Or the old Anglesey Aluminium tower in Holyhead.